The cutest holiday dress ever, our tartan plaid skirted treasure boasts a sweater top in Nautical Navy Blue with a full circle cut attached skirt in red and navy tartan plaid. Long sleeves reach the wrists and end in rib knit for form. A ribbed knit jewel neckline is the perfect complement, and the bottom band of the top is also ribbed for a neat finish. 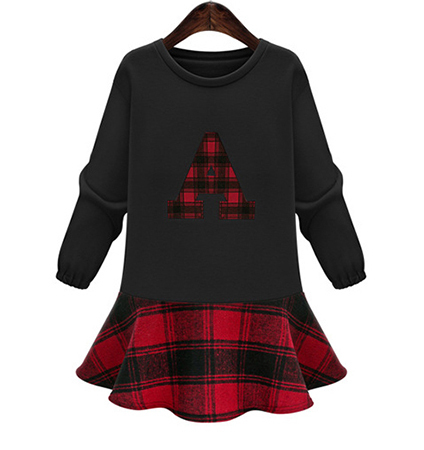 An appliqued Christmas tree in matching tartan plaid is the focal point of this adorable dress, which reaches the top of the knee. Tights and flats combine to make this tartan holiday dress a great choice.